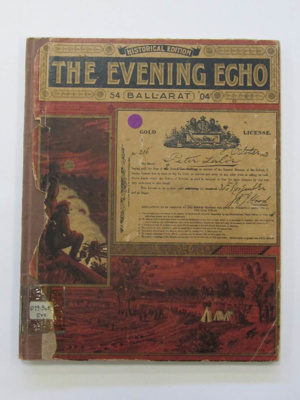 About this objectHistorical Edition of The Evening Echo. Cover depicts a gold license with Peter Lalor's name and two gold fields scenes. Inscription and MarksBHS on inside cover in coloured pencils possibly drawn by N`athan Spielvogel.